Trilobites are an extinct form of arthropod. They came in a wide variety of sizes ranging from being under a millimeter long to being over two feet in length. Trilobites first appeared some 600 Ma. during the Cambrian period. They diversified into many orders, and over a (relatively) short time scale disappeared completely about 250 Ma. The causes of the extinction are not fully clear. They belonged to the phylum Arthropodal (joint-footed), a phylum which to this day represents the most successful in terms of numbers (78%) of all animal life forms, including crabs, centipedes, spiders, shrimps and insects. The name Trilobite, meaning three lobed one, refers to the three longitudinal lobes across the head (cephalon). The entire bodies were also divided into three: the head (cephalon), thorax (chest) made of up to 30 segments and the tail (pygidium). Underneath and rarely preserved are three pairs of legs for the head and paired legs for each pleural groove. 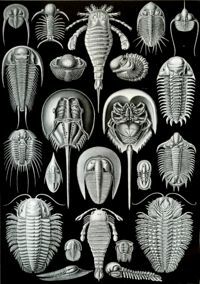 Trilobites are the earliest known animal to possess vision. Some possessed eyes and some seem to have no eyes at all, while others possessed beautiful compound eyes capable of 360 degree vision. The trilobite is Ohio's official state fossil. This page was last modified on 24 June 2016, at 19:15.